Our oldest is graduating from high school next month an she was less then impressed with the school's stuffy announcements (and Dad was less impressed with the cost). She asked me to see what I could do, as I had already made her thank you cards several months ago. Since she plans to major in Animation, I thought it should represent her artsy side. I used the same stamps as I did for her thank yous and went with the same basic design. The stamps are retired Stampin Up's Extreme Elements and stamped in Real Red, Daffodil Delight, Tempting Turquoise, with Pumpkin Pie, Gumball Green, and Blackberry Bliss. The outside of the card is her grad info, printed on vellum using Harry Potter Lumos font from dafont.com and adhered to the front with washi tape. 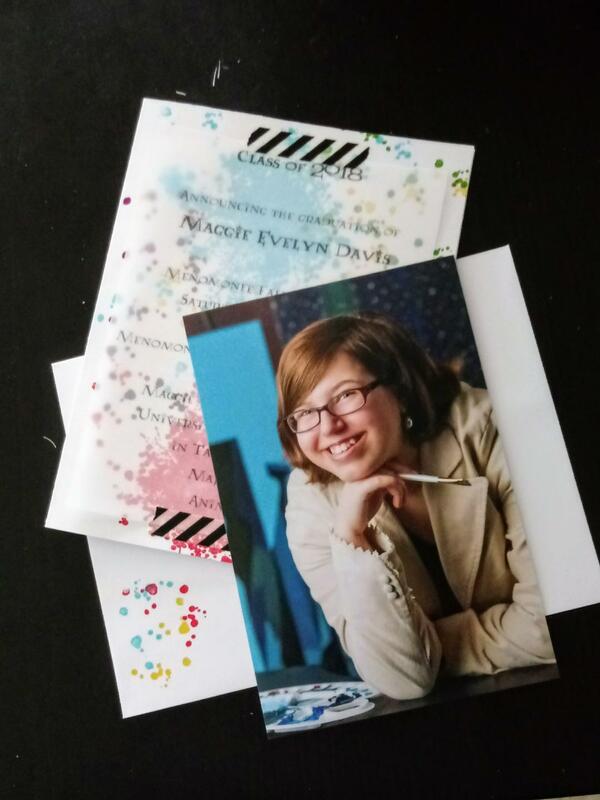 Inside the card (not shown) is her senior photo and details for her open house. I added a few smaller spatters of color using the welcome Stampin Up My Paper Pumpkin set. I finished it by stamping the envelopes in the small spatter print.